NBC’s fan-favorite drama “Timeless” is back for Season 2 with non-stop action, adventure and romance, as the beloved ‘Time Team’ continues to race throughout history in an attempt to prevent the destruction of our world as we all know it. Join cast members Abigail Spencer (“Rectify,” “Oz the Great and Powerful”), Matt Lanter (“Pitch Perfect 3,” “Star Wars: The Clone Wars”), Malcolm Barrett (“Preacher,” “Better Off Ted”), Claudia Doumit (“Supergirl,” “Faking It”) Goran Višnjić (“ER,” “Extant”) and executive producer Shawn Ryan (“The Shield,” “S.W.A.T.”) for an exclusive first look at the third episode of “Timeless” entitled “Hollywoodland,” followed by a Q&A. Fans will get to see a sneak peek of the time traveling trio as they head back to Hollywood in the 1940’s after a Rittenhouse sleeper agent steals the only copy of Citizen Kane. 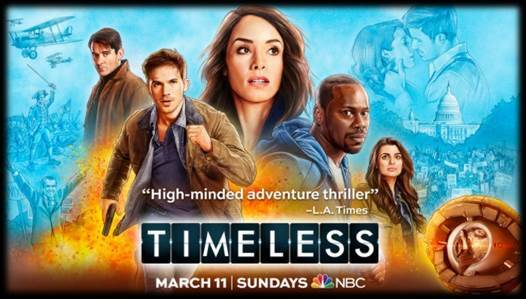 “Timeless” is produced by Sony Pictures Television, Universal Television, MiddKid Productions, Kripke Enterprises, Davis Entertainment returned to NBC on Sunday, March 11th at 10/9c. NEXT POST Next post: Max Vitelli Live On Marks Vs Pro Wrestlers Uncensored!